One of the most famous beach resort cities in the world, just mentioning Cancun conjures images of perfect white beaches, colourful reefs, mysterious Mayan ruins and big parties. Although it is best known for all-inclusive package holidays offering all the glitz and glamour of upmarket beach hotels, complete with a wonderful variety of restaurants and many options for shopping, Cancun is also situated in the region once inhabited by the ancient Mayan people, which adds a seductive historical element to lounging on the beach. Cancun is nestled on the northeastern tip of the Yucatan Peninsula, which entices travellers not only with its gorgeous coastline, but also with relics of the proud ancient culture of the Mayans still strewn throughout the jungled peninsula. Cancun is adored by sun, sea and sand fanatics for its incomparable beaches; by scuba divers and snorkellers for its colourful coral reefs; by young party animals for its enviable nightlife; and by adventurers seeking out what is left of the Mayan kingdom. Cancun's peak tourist season runs from December to April, when the weather is pleasant, storms are least likely, and the sea is generally calm. The Yucatan Peninsula can be hit by hurricanes between June and October, making this a period many prefer to avoid. Essentially Cancun is hot and beautiful year-round but those that prefer to avoid crowds should be wary of travelling during Spring Break (March) when hordes of teenagers descend on Cancun. Read more on Cancun's Climate and Weather. - Marvel at the impressive Mayan site of Chichen Itza, once a thriving ancient centre. - Visit the Museo Maya for some insight into the ancient history and art of the region. - Lounge on the numerous stunning beaches that are Cancun's main attraction. - Ferry across to Isla Mujeres for a day of sleepy island fun. - Take a boat or submarine ride from Playa Linda. - Explore the fascinating Mayan ruins of San Miguelito. - Enjoy a fun day with the family at Cancun's Wet n Wild waterpark. - Go swimming with dolphins at Dolphinaris. The Yucatan Peninsula provides many attractions on Cancun's doorstep, including Mexico's biggest island, Cozumel, which is one of the best scuba diving destinations in the world. The Yucatan is also home to several other wildly beautiful beach resorts including Playa del Carmen and Puerto Costa Maya. International flights to Cancun land at Cancun International Airport, Mexico's second busiest airport, situated nine miles (17km) southwest of the hotel and resort area. Get more information on Airports in Cancun. 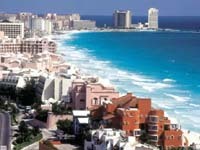 - Cancun generates about a third of Mexico's tourism revenue. - The white sand of Cancun is made from crushed coral which resists the heat of the sun. - Cancun boasts the second largest coral reef in the world, the Great Mayan Barrier Reef.